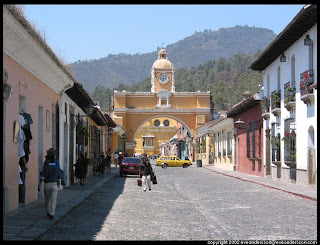 Currently in Antigua, a small colonial town in Guatemala. It's very pretty, surrounded by green hills on all sides (see the picture). I am spending a month avoiding the boston and london winters and travelling through central america and ecuador. Flew into Belize last week and headed straight for the beach - to an island off the coast in the caribbean sea. Went snorkelling in the reef and swam with sharks, which was great fun. Then we headed across to Guatemala to Tikal, which is a nice Mayan temple site, covered by jungle. Spending a lot of time on local buses - including 10 hrs yesterday on a bus (with chickens on it), cramed full with people. Had a couple of nights staying in a tree house (literally, with no electricity or anything apart from a bed, in the middle of nowhere) which was cool! At the other extreme, we`re now spending a few nights in a luxurious colonial mansion, where Bill Clinton stayed recently. I love this part of the world - there`s so much to see and do, from Mayan temples, volcanoes, jungle, beaches and colonial towns to lakes, coral reefs and waterfalls. Next stops are El Salvador, Nicaragua, Costa Rica, Panama and Ecuador... stay tuned for more news! After a month away, I am now nearing the end of my trip and am spending the last few days in the jungles of Ecuador. Yesterday, I had a very close shave... I was mountain biking down from Baños, a small town in the Andes, with a couple of guys I met travelling to a waterfall 30km downhill. All of a sudden an avalanche of huge rocks came down right in front of us, completely blocking the road. Had we been 5 seconds ahead, we would have been easily killed by the boulders and we saw it all come down right in front of us. It´s amazing that I have managed to get to 75 countries without injury! I am loving Ecuador the most. I am spending my last few days canyoning, whitewater rafting and hiking in the amazon jungle, which should be fun!